The gourmet chef at the Rifflin'Hitch Lodge in Southern Labrador, Canada works hard everyday preparing extravagant meals for the guests who come here to fly fish. On this meal menu, each guest will be served a plateful of lobster tail, beef and a mix of vegetables topped off with an amazing sauce. 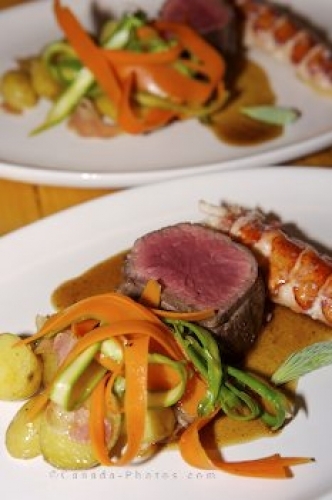 Gourmet meal - Surf'n Turf at the Rifflin'Hitch Lodge in Southern Labrador, Labrador, Canada. Picture of a meal of lobster, beef and vegetables at the Rifflin'Hitch Lodge in Southern Labrador.